Welcome, MN Backyard Birds Brainerd’s Birdscaping Experts! Hello. My name is Judd Brink (owner & guide) of MN Backyard Birds from Brainerd Minnesota! Enjoy the 2nd largest recreational activity in the United States at your home or business with Birdscaping from MN Backyard Birds! I can help you increase the number and variety of colorful songbirds for your enjoyment! I offer and design Birdscaping packages using bird feeding stations that are properly placed and maintained for many Brainerd Lakes Area Resorts, Hotels, Bed and Breakfast, Nursing and Care Facilities, Restaurants and private homes! I also can guide you to best bird watching locations in Central Minnesota. I invite you to view our webpage and blog! Please see our contact us page so we can answer any questions that you may have about this site. I encourage you visit as the site continues to change with new photos and sightings and journal entries. Thank you. 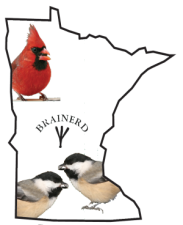 Please visit this link to learn more about MN Backyard Birds and a few of the services that we offer!